It’s hard to believe that a tiny crack could take down a gigantic metal structure. But sometimes bridges collapse, pipelines rupture and fuselages detach from airplanes due to hard-to-detect corrosion in tiny cracks, scratches and dents. A Northwestern University team has developed a new coating strategy for metal that self-heals within seconds when scratched, scraped or cracked. The novel material could prevent these tiny defects from turning into localized corrosion, which can cause major structures to fail. When damaged by scratches and cracks, Huang’s patent-pending system readily flows and reconnects to rapidly heal right before the eyes. The researchers demonstrated that the material can heal repeatedly — even after scratching the exact same spot nearly 200 times in a row. The study was published today (Jan. 28) in Research, the first Science Partner Journal recently launched by the American Association for the Advancement of Science (AAAS) in collaboration with the China Association for Science and Technology (CAST). 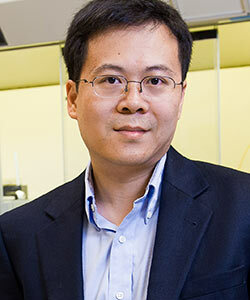 Huang is a professor of materials science and engineering in Northwestern’s McCormick School of Engineering. While a few self-healing coatings already exist, those systems typically work for nanometer- to micron-sized damages. To develop a coating that can heal larger scratches in the millimeter-scale, Huang and his team looked to fluid. But common oils flows too readily, Huang noted. So he and his team needed to develop a system with contradicting properties: fluidic enough to flow automatically but not so fluidic that it drips off the metal’s surface. The team met the challenge by creating a network of lightweight particles — in this case graphene capsules — to thicken the oil. The network fixes the oil coating, keeping it from dripping. But when the network is damaged by a crack or scratch, it releases the oil to flow readily and reconnect. Huang said the material can be made with any hollow, lightweight particle — not just graphene. The coating not only sticks, but it sticks well — even underwater and in harsh chemical environments, such as acid baths. Huang imagines that it could be painted onto bridges and boats that are naturally submerged underwater as well as metal structures near leaked or spilled highly corrosive fluids. The coating can also withstand strong turbulence and stick to sharp corners without budging. When brushed onto a surface from underwater, the coating goes on evenly without trapping tiny bubbles of air or moisture that often lead to pin holes and corrosion. “Self-healing microcapsule-thickened oil barrier coatings” was supported by the Office of Naval Research (ONR N000141612838). Graduate student Alane Lim and Chenlong Cui, a former member of Huang’s research group, served as the paper’s co-first authors.